Finding birthday cupcake ideas isn't really a challenge. The challenge is making a choice between all the creative ideas out there. Birthday cupcakes are sure to please every guest, can be presented in a variety of ways and can be individually customized for that extra personal touch. When it comes to cupcakes, many girls tend to enjoy fancy decorations, garden or flower themes, and themes featuring their favorite characters. Cupcakes that inocorporate the birthday girls' favorite colors or use ornate decorations are especially popular. Surprisingly, you can make a presentation fit for a princess that doesn't cost you a king's ransom in time and money. Serve little princesses at a princess party their own cupcakes topped with crowns. Color buttercream in shades of pink or purple, and use sprinkles in those shades to decorate the tops of the cupcakes. Top birthday cupcakes with jewels made from confectionary molds. You can also dust finished pieces with a metallic luster dust for sparkle. Place plastic garden fairy cake picks on the cupcakes and decorate with sugar flowers. Accent flower-topped cupcakes with grass using piped green buttercream. Create 3-D shapes of different flowers by stacking up cut-out fondant shapes. Pipe buttercream into rosettes and daisies directly onto the cupcake tops, and sprinkle with an edible glitter. You can even arrange jelly beans in daisy shapes, using one color for each cupcake for all the petals. Enhance fancy birthday tea parties with cupcakes decorated with bows, pink parasols and lots of edible glitter. Pipe mini teacup shapes on top of the cupcakes, as well as mini teapots. Candy butterflies and fan shapes made out of cookies are both fun topping ideas for tea party cupcakes. Girls aren't the only ones who love cupcakes. Boys themes can include pirate adventures, trucks and trains or even sports designs. Enliven a pirate-theme birthday party with cupcakes featuring the Jolly Roger made with candy molds. Create cupcake treasure islands using candy palm trees. You can also pipe palm trees onto parchment paper, leave them to dry, and then stand them up on the cupcakes. Sprinkle the tops with crushed graham crackers for the sand. Simple maps can be drawn on each one using a piping bag and a small round tip. Pipe a dotted line in a loop pattern and end with a large X to indicate where the treasure is buried. Pipe planes, trains and cars on top of cupcakes. You can also create vehicles out of chocolate molds or mold them from rolled fondant. Purchase candy sprinkles in the shape of various vehicles and sprinkle on top of buttercream swirls. For sports fans of all ages, you can create baseballs, footballs, soccer balls, and basketballs and pipe them directly onto the top of the cupcake using different pastry tips. You can also purchase plastic 3-D cupcake picks for easy decorating. 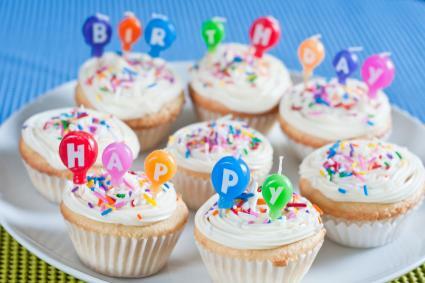 Looking for birthday cupcake ideas for boys and girls? Parties with a safari theme can showcase cupcakes with elephants, lions and zebras on top. Balloons and clowns along with some brightly colored sprinkles can spruce up circus themes. If the birthday is around a major holiday, use colors and decorations representative of the event. For example, Halloween is a great theme for birthday cupcakes in October with spooky mummies, bats and witches' fingers for decorations. After decorating the cupcakes, consider different ways to present them. You can serve birthday cupcakes individually or all together in a group. Display options include special cupcake stands that hold the cupcakes separately, or grouping them on a multi-tiered stand. You can also try a platter to display the cupcakes as one cake. No matter how you display your cupcakes, everyone at your party will love your creative approach to birthday cupcakes.